Doctors are always telling their patients to get screenings for cancer. They look out for warning signs and act quickly when tumors or masses start forming on the body. 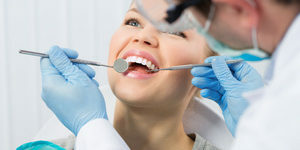 But few patients may realize that the first line of defense against oral cancer is actually while sitting in the dental chair at their routine hygiene cleaning. Since the mouth is the gateway to the body, dentists often notice changes in your body before your doctors do. Bad breath? Could be a problem with your medications. Rampant gum disease? Could be the culprit behind your heart or breathing problems. When it comes to oral cancer warning signs, dentists can spot the exposure before the cancer worsens. Unfortunately, oral cancer has over 48,000 new diagnoses every year in the US, and it’s why catching them early with screenings is so important. It’s long been believed that the mouth is the gateway to the body, and that any diseases you acquire there can affect the rest of your body in small ways. Evidence has suggested that patients who have gum disease or tooth decay can have those bacteria travel to other areas of their body and have adverse effects. It’s not unusual to think that oral cancer can do the same. Even the smallest of symptoms, such as discoloration, patches, or swelling, can be signs of bad things to come. 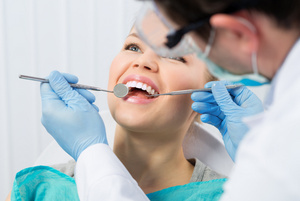 An oral cancer screening typically takes place during a routine hygiene appointment. Dr. Gottesman will examine your neck and chin for any unusual lumps or lesions. He will also check your gums, inside cheeks, tongue, underneath your tongue, and roof of your mouth for any abnormalities. These abnormalities can include white or black discolorations, red or white patches, swelling, bumps, and more. Hygiene cleanings also entail getting x-rayed, and if any abnormalities appear on your x-ray, it may require further diagnosis. How Does Oral Cancer Develop? There is no definitive cause of oral cancer, but there are a number of factors that can increase your risk for oral cancer. Tobacco: Certain chemicals in tobacco products, from cigarettes to chewing tobacco, infect and damage the cells in your mouth, leaving them vulnerable to becoming cancerous. Heavy Alcohol Consumption: Similar in effect to tobacco, a heavy consumption of alcohol can irritate the tissues enough that they become vulnerable to changes in structure and chemical imbalance. HPV: Human papillomavirus is a sexually transmitted infection that can be transferred to the mouth, and has a high risk of turning cells cancerous. Old Age: Sometimes, oral cancer can develop on its own due to aging tissues and cells. Red Lesions: These can appear like red patches on your tissues, almost like a rash. Unusual Swelling: Some swelling from accidentally biting your cheek or lip are normal, but if areas of your mouth are starting to swell for no reason, this is something to bring to our attention. White or Black Patches: Discolorations are also a warning sign of tissues changing due to cancer. Keep an eye out for these color changes in your tissues. Nodular or Papillary Masses: These masses can appear in your cheek tissues, and are often uncomfortable for the normal contours of your mouth. Dr. Gottesman and Dr. Karabin routinely check patients for oral pathology as part of their services. If they notice something unusual about your oral health, such as the symptoms mentioned above, then they will take samples of your tissues for further diagnosis. It’s been found that patients who have their oral cancer caught early have a higher chance of more effective treatment. If it has been confirmed that you have oral cancer, the next steps will be to discuss treatment with your medical doctor or an oncologist. One of the big reasons that patients avoid the dentist is due to an established dental fear or anxiety. If you fall into this category, you’re not alone! Since many patients are just like you, we offer a few sedation dentistry options to make your visit or cancer screening more comfortable for you. Oral Conscious Sedation: Oral conscious sedation is typically a pill that is consumed before you reach our office for your appointment. By the time you reach us, you will feel extremely relaxed and calm for your appointment. IV Sedation: This type of sedation is administered through the arm and contains a combination of chemicals that coax you into a state of deep relaxation. This does not “put you to sleep”, but instead allows you to relax while still communicating with our dentists. You will also have no memory of the procedure. Inhalation Sedation: This is nitrous oxide and is inhaled using a mask over the nose. Similar in effect to IV sedation, patients are put into a state of deep relaxation for the duration of their visit. Patients in New York need to be aware of the risks that can come from oral cancer, and why it’s so vital to get screened. Oral cancer has a nasty habit of sneaking up on patients, especially if they are in poor health or don’t visit the dentist regularly. Give us a call to learn more about how to schedule an oral cancer screening. This entry was posted in Oral Health and tagged oral cancer, oral cancer screenings, oral pathology. Bookmark the permalink.